Late Sunday night, word began trickling out that Dallas Mavericks owner Mark Cuban had revoked the credentials of two ESPN reporters, Tim MacMahon and Marc Stein. The initial reporting suggested that Cuban was upset that MacMahon would be spending less time on the Mavericks beat this season, as he’s also covering the Memphis Grizzlies and other national NBA stories. In email exchanges with Deadspin, Cuban insisted that wasn’t the case. He pulled their credentials “in support of sports journalists,” he wrote, but otherwise wouldn’t expound upon that, instead writing that he wanted “to give espn and the NBA a chance to come up with a solution” (this and all other quotes sic). He also denied a rumor making its way around the Mavs beat that the revocation was in retaliation for a particular story MacMahon is working on. “No. lol” Cuban wrote, and ESPN sources also insisted the rumor was bunk. Last night, Cuban revealed to the Associated Press that his true concern was over the future of automated content. Cuban believes that we are rapidly approaching a future in which most basketball game stories are written by computers, not humans. He sees ESPN’s coverage as a sort of bulwark against this automated reporting, and if they aren’t going to cover the team full-time, he doesn’t want them to cover the Mavericks at all. Cuban asked us recently if we plan to cover all 82 regular-season games and we said yes. We’ve always done that and plan to keep doing it because that’s what our readers expect from us. He also offered to help us get more video and we’re going to take him up on it. That’s about it. Our beat writer often flies on the team plane and we reimburse the Mavs for his flights, but that’s been going on for years. Fort Worth Star-Telegram NBA editor David Humphrey declined to respond on the record. The above parts of Cuban’s arguments are, broadly, defensible. He wants as much coverage of his team as possible, especially from a prominent national outlet like ESPN. (We’ll also set aside the fact that eight years ago he banned bloggers from the locker room in reaction to a negative piece.) And it seems like he proactively tried to come up with solutions to help ESPN cover the team—even if ESPN was never going to accept them—which is a lot more than some owners would do. But if the goal is comprehensive coverage, banning ESPN’s reporters is an exceedingly strange move, especially considering Marc Stein has been going to Mavericks games without really covering the team for over a decade. The pragmatic move is to take the 50-60 regular season games ESPN was going to cover this year and be grateful they’re willing to devote that many resources to a team that will finish far out of the playoff race. It’s by some measures more in-person ESPN coverage than a great team like the San Antonio Spurs were going to get, and will only embolden those within the company (and there are many) who would already prefer to cover the Mavericks much less. How is that positive for any nba team or their fans when 30 games have second rate coverage ? And what happens and what message is sent to fans when those games are covered by an algorithm in the future ? Machine and deep learning and algorithmic coverage of sports events is going to happen. This isn’t a coherent argument. Because Cuban believes it is a “certainty” that Mavericks “games will be covered algorithmically” in the near future ... that means ESPN has to cover every single Mavericks game now? Because Cuban doesn’t want robots to cover basketball games ... he’s refusing to let prominent humans cover them? Currently, algorithmic news stories are used to cover heavily numbers-based subjects, like finance and minor league baseball. Generally these stories wouldn’t be written at all, because there are so many minor league games and stock changes, and there is such a tiny audience for this news. But if a computer “writes” a 300 word “story” based upon a box score, it’s at least better than the alternative of it not existing at all. Cuban is probably right that a time will come in which news organizations will attempt to use algorithmic reporting instead of reporters, rather than just to fill gaps in coverage. But I’d venture that time is a lot farther off than he believes, and that the day that a computer can interview a coach, notice something interesting happening off-camera, and give the proper context to carefully-selected facts is even farther off. If fans are still interested in written coverage of basketball—or, more specifically, if fans are interested in paying for written coverage of basketball—it will continue to be covered by human beings. If they’re not, they’ll get a four paragraph computer-written gamer, and everything will be okay. 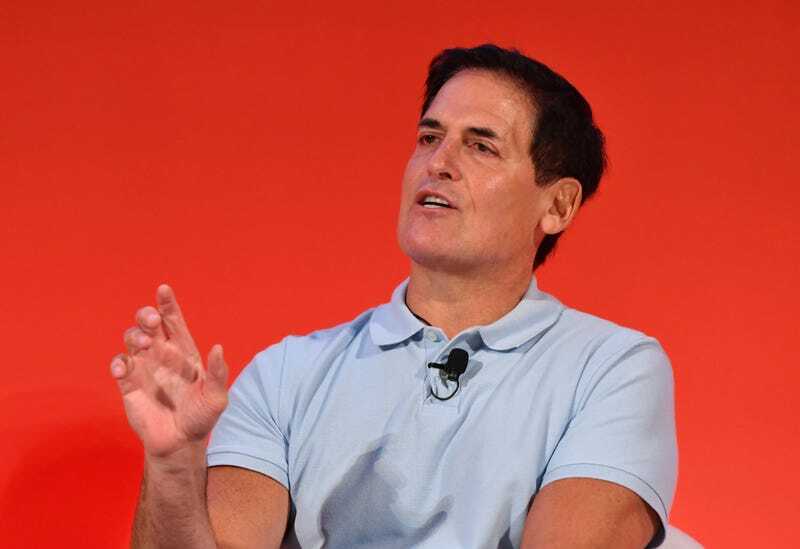 As a journalist I’ll be bummed about other journalists (or me) being out of a job, and as someone who values the craft of reporting I’ll miss good writing, but what I or Mark Cuban think about journalism matters very little in the grand scheme of things. Anyway, while Cuban’s argument doesn’t particularly make a lot of sense, it is always interesting to know what an NBA owner is thinking. In that spirit, here is Cuban’s full e-mail to Deadspin. He didn’t respond to follow-up questions. These weren’t exclusive stories to espn. So why would they choose the option that was probably the least expensive but certainly also the least quality of the options ( and this isn’t a knock on wire services. Their job isn’t to cover a game with one teams fans in mind )? And if it’s 30 games now for 19 teams. What would keep it from being 60 games for 25 teams ? What was their long term thinking ? So the next question is where would it leave Mavs fans who wanted game results coverage of nothing changed and espn didn’t send a reporter for 30 games ?